Animaux aquatiques - Dictionnaire Visuel - Copyright © 2005-2016 - Tous droits réservés. [img]https://infovisual.info//storage/app/media/02/img_fr/037 Diff. 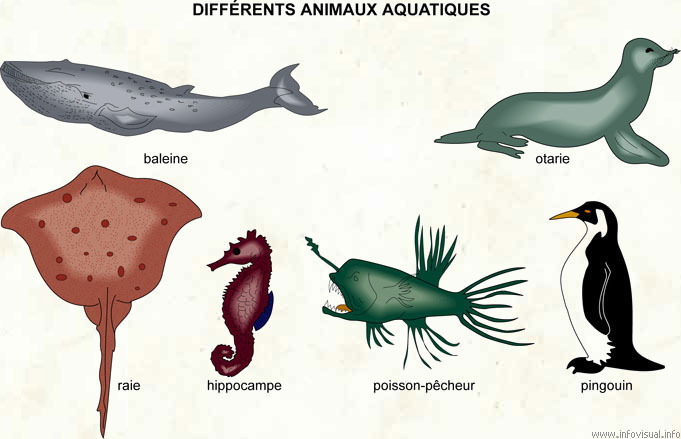 animaux aquatiques.jpg[/img] [url=https://infovisual.info/fr][/url] - [url=http://www.infovisual.info/]Dictionnaire Visuel[/url] - Copyright © 2005-2016 - Tous droits réservés. Batoidea is a superorder of cartilaginous fishes containing more than 500 described species in thirteen families. They are commonly known as rays, but that term is also used specifically for batoids in the order Rajiformes, the "true ray". Batoids include stingrays, skates, electric rays, guitarfishes and sawfishes. Batoids are flat-bodied, and, like sharks, are a species of cartilaginous marine fish, meaning they have a boneless skeleton made of a tough, elastic substance. Batoids also are like sharks in having slot-like body openings called gill slits that lead from the gills. Batoid gill slits lie under the pectoral fins on the underside, whereas a shark's are on the sides of the head. Most batoids have a flat, disk-like body, with the exception of the guitarfishes and sawfishes, while most sharks have a streamlined body. Many species of batoid have developed their pectoral fins into broad flat wing-like appendages. The eyes and spiracles are located on top of the head.